Here we have Bank of America's latest attempt to show that it's not a soul-sucking, cold and heartless corporation. Did it succeed? It's no secret that I distrust corporations. I believe that in general, they abuse and take advantage of Seniors the Injured and Disabled. In other words, the exact classes of people that I have pledged to protect. 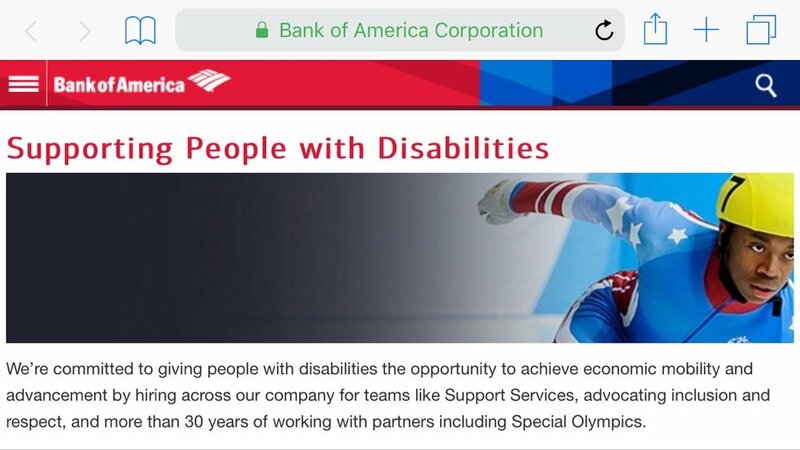 For example, if an employee of Bank of America became disabled or injured while working for Bank of America, do you think that BOA would think twice about firing that person? I have to admit, their marketing team did a great job on this project. This photo is particularly heartwarming on the surface. But it you've ever experienced BOA customer service, you have to be skeptical about whether BOA really cares about anyone other than dead presidents. Did you know that BOA is phasing out live tellers? Go to a location near you and try to talk to a teller. They will tell you to go to the super small video monitors where you will speak to someone piped-in from who-knows-where. Is BOA really committed to the American public? Does having Rheumatoid Arthritis mean I can get Social Security Disability or SSI? Rheumatoid Arthritis (RA) is a very serious joint disease that affects many Americans. A client asked me whether having RA and getting infusions would allow her to automatically be eligible for Social Security Disability or SSI. The answer is, well, it depends. Sorry to be a lawyer but there are very few conditions that are disabling right after diagnosis. First of all, if you're working full time you're not disabled under SSA rules no matter what your diagnosis is (there are very limited exceptions). Secondly, very few diagnoses are instantly disabling under SSA rules: ALS and End Stage Renal Disease are the only 2 that come to mind. RA, however, can be debilitating and lead to the SSA finding you disabled if it's serious enough. There are fairly complex rules governing whether RA is disabling but most rules concern the symptoms, including fatigue, swelling and pain. Also it depends on what body part the RA affects. If RA affects your hands very severely then it can be impossible to work any kind of job. Almost all jobs require at least occasional use of the hands. Those over 50 with RA have a very good chance of winning their Social Security Disability/SSI case because RA so often affects the hands and feet. Standing can be painful, and sitting using ones' hands can be painful. It is important to keep telling your doctor or specialist about your symptoms so that SSA will have the evidence to know that you are disabled. Disclaimer: This blog post is for general information only, speak to a lawyer if you need specific information about your case. We will give you a free consultation, as do most lawyers. Learn where the Social Security Hearing Office in Baltimore is located, and what to expect. In the above video, Social Security Disability/SSI Lawyer Emmett B. Irwin explains where the Baltimore Hearing Office is located and what you can expect at your hearing. Clients often come to me wanting to get "Power of Attorney" to protect a loved one's finances or health, or both. If the loved one is mentally incapacitated, however, a "Power of Attorney" is not valid. A Power of Attorney is a document that the loved one must sign voluntarily, knowing/understanding what power she is giving away to the Agent (the person protecting her financial and/or medical affairs). A loved one cannot execute a valid Power of Attorney if she is mentally incapacitated and doesn't understand what she is signing! So how can we protect her interests? In Maryland, a Guardianship Petition will likely be filed under these circumstances. A Guardianship Petition must be filed in the Circuit Court, and a Circuit Court Judge will decide if a Guardian will be appointed for the alleged disabled person. The Guardian can be appointed to manage the loved one's financial affairs (Guardian of the Property), personal, including medical, affairs (Guardian of the Person), or both. This process is very complicated, time-consuming, and expensive. But protections must be in place so that people are not taken advantage of. Imagine if someone tried to gain access to your financial and medical details! You would want protection from the law. The difference between Power of Attorney and Guardianship is essentially that Power of Attorney is relatively easy to get as long as the loved one knows what she is giving away. Guardianship is the last resort for loved ones who are mentally incapacitated (from a disease like Alzheimer's, for example). Did I get a good Judge for my Baltimore Social Security Disability/SSI Hearing? WHAT SHOULD I DO IF SOME TURKEY HITS ME ON THANKSGIVING? Before that happens you should increase your Uninsured Motorist bodily injury coverage – there are millions of drivers out there that are uninsured, and think of all the idiots who will be driving drunk on Thanksgiving. If you have only $30,000 worth of Uninsured Motorist coverage (the minimum in Maryland), that IS NOT ENOUGH! Medical bills from a car accident can be $100,000 or more, and that doesn’t even count lost wages and pain/suffering. If a person hits you and is uninsured, you will likely not be fully compensated unless you have really robust Uninsured Motorist coverage. I personally have $100,000(per person)/$300,000(per accident) coverage and it is probably not enough. 1. Seek medical treatment – if you were hit with some force there could be injuries you don’t know about on the day of the accident. I recently had a client whose car was hit by a truck. He was shaken but thought he was fine physically. A few days later, however, his shoulder and arm started hurting and he couldn’t go to work (he has to lift heavy objects for his job). Turns out he had a small fracture in his spine that he wasn’t aware of. Most accident settlements are based on the dollar amount of the medical bills. Don’t commit fraud, but get medical treatment for legitimate pain/limitations no matter how minor you think it is. If you don’t treat your injuries you will not get properly compensated by the insurance company. 2. Don’t settle with the insurance company right away – Insurance companies will try to get you to settle before you are done getting medical treatment because it saves them money. My wife was just learning to drive as a teenager when she was hit by a driver who made an illegal U-Turn. Her car was totaled and she was taken to the hospital. She was discharged from the hospital and thought she was fine (see #1). The other driver’s insurance company called her and gave her an offer a few days later, convincing her that she would be saving her parents money on her medical bills. Instead of getting a lawyer (she hadn’t met me yet) she immediately accepted their offer, which didn’t even cover the cost of replacing her car. The CEO of the insurance company probably got another Mercedes that year (his fifth), but she was left out in the cold. To make matters worse, she found out later that the impact had caused significant damage to her upper spine. A chiropractor fixed the damage, thankfully, but she paid several thousand dollars out of her own pocket. 3. Call a lawyer! – You knew this was coming because I’m a lawyer :) But it’s also great advice. The Law Office of Emmett B. Irwin will be answering/returning calls before, after, and on Thanksgiving if you call 443-447-7493. A reputable attorney can direct you to a medical provider in your area who has experience dealing with injuries from car accidents. A good attorney will maximize your settlement and guide you through the process. Enjoy your Thanksgiving and be safe! Disclaimer: this Blog post is meant for general information purposes, it is not legal advice. Everyone’s situation is different, if in doubt get legal counsel. Social Security really screwed up the increase in benefits for 2017! Yesterday Social Security announced the Cost of Living Adjustment (COLA) for 2017 here and it's a doozy! Despite Seniors and Disabled people paying significantly more for health care, rent and food these days, Social Security is only increasing Retirement, Disability and Supplemental Security Income (SSI) benefits by 0.3% in 2017. For someone getting $1000 per month in benefits, they will get a whopping $3 raise in 2017. What?!? Meanwhile, Social Security is collecting more money from working people, raising the maximum amount of earnings subject to payroll tax from $118,500 per year to $127,200 per year. That's a more than 7% increase. So the government is taking 7% more from us and paying out 0.3% more. I don't pretend to know the accounting vagaries of the Social Security Administration, but even I know that there is something seriously wrong here. To paraphrase the words of Forrest Gump, I'm not a smart man, but I know what getting swindled is. One of the major reasons for the very low COLA next year is the erroneous way Social Security defines inflation. The general rule is that Social Security Retirement, Disability and SSI benefits are inflation proof. In other words, if inflation increases then benefits increase an equal amount. Great, right? No so fast, the devil is in the details. Congress has decided that inflation for COLA will be based on the Consumer Price Index for Urban Wage Earners and Clerical Workers (CPI-W), which includes gasoline prices. The CPI-W as a whole reflects prices paid by working people. The problem? Seniors and Disabled people do not have the same costs as working people! If gasoline prices are lower, for example, Seniors and Disabled people will not save as much money as working people who commute every day. So in the last few years, there has been little to no increase in benefits paid by the SSA partly because gas prices are so low. But the people getting the benefits are paying more for everything else! As usual, the little people are getting swindled in the numbers game. When I apply for Social Security Disability/SSI, who is responsible for getting medical records to prove that I'm disabled? The general rule is that you are ultimately responsible for getting medical records and filling out forms to support your Social Security Disability/SSI application. This is a very harsh rule and can result in unjust situations where Social Security makes incorrect decisions. After filing a Social Security Disability/SSI application, Social Security will send an Adult Function Report, a Work History Report, and perhaps other forms based on the claimant's alleged disability (for example, Asthma Report, Adult Pain Report, etc.). Often Social Security caseworkers will gladly deny a case for lack of a form, despite the claimant being clearly disabled. For example, I once had a client who had a stroke and was confined to a nursing home. Social Security sent her a form to fill out multiple times when it was clear from her application that she could no longer read or write because of the stroke. They should have sent the form to her representative (me), or found her disabled without the form being completed, because she was totally incapacitated by the stroke. However, the caseworker chose to use the form as an excuse to deny her case. Luckily my client was approved at an appeal level. Moral of the story: fill out all of the forms and send them back! No matter how silly the form is, if you don't send it back Social Security will use that against you. A claimant is responsible for furnishing medical records associated with his/her case. What?!? This is impossible for some people and disproportionately hurts the poor. Medical records can be very expensive, and some doctors won't release them to a patient. The good news is that Social Security will request the records on your behalf and pay for them. But don't be fooled! Social Security will send one request at the initial application stage, and a second request at the reconsideration stage (if your state has a reconsideration stage), but generally does not follow up on those requests. If the medical provider doesn't send the records, Social Security will not punish the medical provider, it will punish you by denying your claim. At the hearing level, enforcement of the medical record rule becomes even harsher. Social Security will not request your medical records at all. You are responsible for getting them. The one way of getting out of this responsibility is to request a subpoena from the Administrative Law Judge to the medical provider. Some medical providers will not respond to the subpoena, however, and the Judge may make a decision with the medical records he/she already has. The good news is that most claimants have an attorney at the hearing stage, and most attorneys will request the medical records and pay for them (if the cost is not too high). Disclaimer: This article is meant for general information only and is not intended as legal advice. Every case is different, consult an attorney if you're not sure. I am 52 years old, have severe back pain and can't do my job as a carpenter anymore, can I get Social Security Disability or SSI? It depends! I'm sorry, I know you are tired of hearing that, but it's true. The Social Security Administration (SSA) will probably find you disabled if 1) you are not engaging in Substantial Gainful Activity (working and earning more than a certain amount of money per month); 2) you have a severe impairment or combination of impairments that is expected to last 12 months or more or is expected to end in death; and 3) you meet or equal one of the SSA's listings; or 1) & 2) and 4) can't perform any of your relevant previous jobs; and 5) can't perform any other job that is available to you in significant numbers in the national economy, based on your age, education level, and job skills. Also, drug and/or alcohol abuse cannot be a material factor in your disability. This is a general description of the disability standard which leaves out several rules and exceptions but is an excellent starting point for someone to determine whether he/she is disabled according to Social Security. So back to you. You were a carpenter, but severe back pain has prevented you from making your usual woodworking magic. Sadly this is a common situation! Gone are the days when someone can do a physically demanding job for a reasonable number of years then retire with a pension. Nowadays the average American has to work until they drop! And it sounds like you have indeed dropped. First, you may not be disabled if you took another kind of job. No matter that you can't be a carpenter anymore, if you are working at another job for more than SGA then the SSA will almost surely find you not disabled. Second, if your back pain is expected to last more than 12 months or result in death (I'm guessing not, but who knows?) then the SSA may find you disabled, but you must also pass 3) or 4) and 5). It is unlikely that you meet a listing, not may people do, but you can look at them here. There are special rules between 3) and 4) that I won't get into but you can read about them here. So that leaves 4) and 5), and you have to pass both to be disabled if you don't pass 3). It is clear that you can't work as a carpenter anymore, but have you done another kind of job in the 15 years before you became disabled? If you can do any of your previous relevant employment, SSA will likely find you not disabled. If not, we can go to 5). I could write a whole book on the dreaded "Step Five" which would instantly put you to sleep. It is a complex and confusing subject. To put it simply: you are a 52 year old ex-carpenter, and people over 50 are in a favored class according to the "Step Five" rules. The SSA will probably find you disabled if you have no recent education that would lead to skilled work or relevant, transferable work skills, and are limited to sedentary work. Confused? You're not the only one. The staff members at the SSA often do not know the rules very well. So if you get denied, don't give up! A good lawyer can help tremendously. Disclaimer: This post is not meant to be legal advice, it is for informational purposes only, and any similarity to a reader's case is purely coincidental. If I go into a nursing home will the government get my Social Security check? Like the answer to so many legal questions, the answer to this question depends on your specific circumstances. If you receive Supplemental Security Income (SSI) over $30 per month (at the time of this writing) then the answer is yes, the Social Security Administration (SSA) will lower your SSI payment to $30 per month. Social Security Disability Insurance (SSDI), or Social Security Retirement, however, should never be lowered in this fashion. As long as Medicare or some other insurer is paying your nursing home bill you are entitled to your SSDI/SS Retirement check. The same goes for the unfortunate situation in which you are paying your own nursing home bills. In Maryland, if Medicaid starts paying your nursing home bill, however, you will start to be responsible for a "cost of care." Your "cost of care" is most of your income if you're single but not paid to the government. You owe that money to the nursing home, and for-profit nursing homes are generally very aggressive in relation to collecting "cost of care." You should not lose your Medicaid if you don't pay "cost of care" but the nursing home bill office will be not-so-happy campers. The nursing home may try to kick you out of the facility by bullying you/your family or even try to get you evicted! On the other hand, in a situation where you are on Medicaid and have a spouse in the community, there is a spousal allowance if your spouse is dependent on your income to pay living expenses. The "cost of care" is reduced and the Medicaid payment is increased to account for those living expenses. But a spouse with a large income will not be entitled to a spousal allowance. Disclaimer: This post is for informational purposes only and not intended to be legal advice.